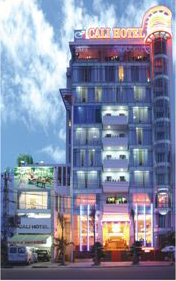 Welcome to Cali Hotel is located in the heart Qui Nhon city, on Hoang Quoc Viet road, near the Qui Nhon seaport, a few minutes of touring car from the sector of economy of Nhon Hoi . Cali Hotel is surrounded by green tropical plants and offers breathtaking views of ecological lake. Our 11 story 25 luxurious room hotel is specially equipped with the latest in equipment and offers luxurious comfort. Our friendly and well-trained staffs offer special attentive service to all our guests. You will have a royal time at Cali Hotel! ...... Restaurant at the ... floor with cozy warm and inviting atmosphere, offers a large choice of traditional Vietnamese, Western and Oriental menus. Our reputable cuisine creats many fresh and tempting selections from our experienced chef.